Ask RP Photonics for any advice in the area of pulse generation, be it with Q switching or mode locking. 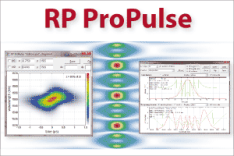 RP Photonics also has the software RP Q-switch to simulate laser dynamics, and RP ProPulse for the simulation of ultrashort pulse propagation. Optical pulses sometimes occur in the form of double (or multiple pulses). This phenomenon can arise under different circumstances, as discussed in the following. If the switching time of the modulator is too long, the first pulse may not be able to extract fully the energy stored in the gain medium. A second pulse may then be generated at a later time, where the modulator has reached the state of lowest loss. If the laser is continuously pumped and the opening time of the modulator is too long, sufficient energy may be accumulated in the gain medium to form a second pulse. 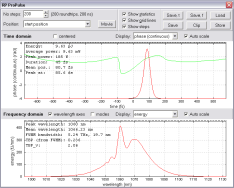 For predicting or analyzing such effects, it can be very helpful to simulate the laser dynamics numerically. With mode locking of a laser, one usually obtains a single ultrashort pulse circulating in the laser resonator, or (with harmonic mode locking) multiple pulses with equidistant spacing. In some situations, however, a circulating pulse may break up into two or more closely spaced pulses, leading to multiple pulses in the output pulse train. This occurs particularly often in passively mode-locked lasers operating in the femtosecond domain, e.g. with soliton mode locking. Figure 1: A pair of 120-fs pulses with a 1-ps temporal spacing. 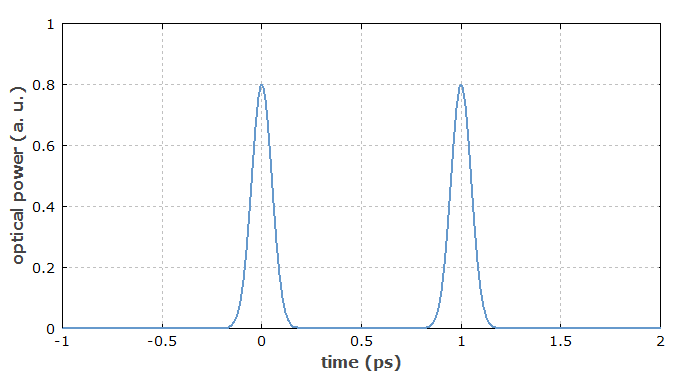 Figure 2: Optical spectrum of a double pulse as shown above. Both pulses are assumed to have a center frequency of 300 THz. 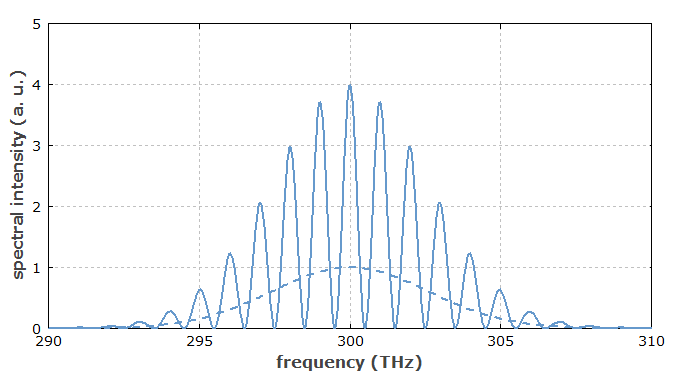 The spectrum (solid curve) is modulated with a frequency of 1 THz, which is the inverse pulse spacing. For comparison, the dashed curve shows the spectrum of a single pulse. Multiple pulses can sometimes form a relatively stable configuration, since there can be various physical effects which permit some kind of interaction between the pulses. These pulses can then do many resonator round trips with constant spacing and even constant phase, i.e., they remain mutually coherent. As a result of that, the optical spectrum is strongly modulated (see also a Spotlight article). In fact, such a spectrum often leads to the discovery of that phenomenon. In other cases, however, multiple pulses can be very unstable, at least concerning their relative phase. A modulated spectrum then cannot be observed. An absorber with a narrow absorption spectrum, located at a minimum of the modulated spectrum of a double pulse (see above), should not attenuate the double pulse. How can this be, given that the absorber “can not yet know” about the second pulse when it is hit by the first one? As a hint, consider that a narrow-band absorber can be seen as a weakly damped oscillator which interacts with the double pulse. Zero spectral power density at a minimum of the double pulse spectrum means that the absorber will not be excited after passage of the double pulse. Also, consider Kramers–Kronig relations when investigating the effect of the absorber on the double pulse. It can often be seen as a modulation of the optical spectrum, recorded with an optical spectrum analyzer (see above). This method may fail, however, when the relative phase is not sufficiently stable, or when the spectral resolution is insufficient (for large pulse spacings). A more direct way is to use a fast photodiode and a sampling oscilloscope. Correct triggering may require special care and is challenging particularly in unstable situations. Only for pulse spacings of 100 ps or larger is the measurement bandwidth of a fast photodiode sufficient for detecting double pulses. For small enough pulse spacing, double pulsing may also be detected with an autocorrelator. A sign of double or multiple pulsing can be that the conversion efficiency of a frequency doubler is lower than that theoretically expected or it fluctuates without apparent reason. This results from the reduced peak power, when a certain total energy (as obtained from the measured average laser power) is spread over several pulses, or from fluctuations of peak power in situations with unstable pulse numbers.